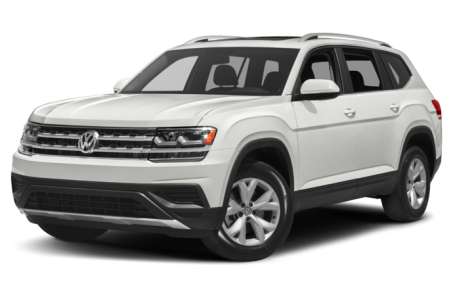 The 2019 Volkswagen Atlas is a full-size SUV that seats seven passengers across three rows. Maximum cargo capacity is 96.8 cubic feet with the rear seats folded down. Under the hood, the Atlas has two engine options: a 235-hp, turbocharged 2.0-liter four-cylinder engine a more powerful 276-hp, 3.6-liter V-6. Both engines are mated to an eight-speed automatic transmission. Front-wheel drive comes standard, while all-wheel drive is available. The 2.0T has four trim levels: S, SEL R-Line, SEL Premium, and SEL Premium R-Line. Five trims are available for the 3.6L V6: S, SE, SEL, SEL R-Line, and SEL Premium.